Heat oven to 350°F. Spray or lightly grease 2 large cookie sheets. In large bowl, beat 3/4 cup butter with electric mixer on medium speed until fluffy. Beat in 1/2 cup sugar, the egg yolks, vanilla and orange peel until light and fluffy. In medium bowl, mix flour, baking powder and salt until well blended. On low speed, beat flour mixture into butter mixture. Shape dough into 1 1/4-inch balls. Measure 2 tablespoons sugar into small bowl. Dip top of each ball into sugar. On cookie sheets, place balls 2 inches apart. Make large indentation in center of each cookie with thumb or end of wooden spoon or thumb. Bake 12 to 14 minutes or until set. If necessary, make another indentation in center of each cookie with thumb or end of wooden spoon or thumb. Cool 2 minutes; remove from cookie sheets to cooling rack. Meanwhile, in small microwavable bowl, microwave chocolate chips, cream and 1 tablespoon butter uncovered on High 40 seconds; stir. Continue heating and stirring 15 seconds at a time until smooth. Stir in corn syrup. Spoon generous 1/2 teaspoon filling into indentation of each cookie. 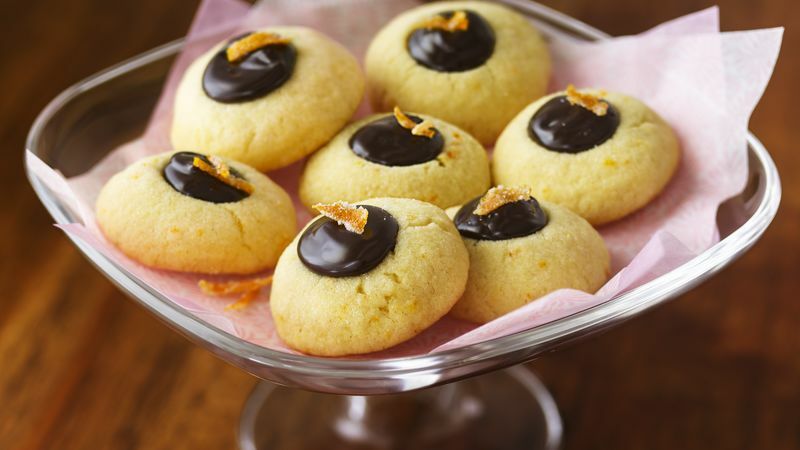 Top each cookie with piece of sugared orange peel. Crank up the orange flavor by stirring 1 tablespoon orange-flavored liqueur into filling. Toss small pieces of orange peel with sugar for an easy garnish.